On December 10th Brandon Fields penned an open letter to Loblaws that he posted to Facebook. In it he was critical of Loblaws' display of the National Enquirer issue seen up above in the checkout aisles. 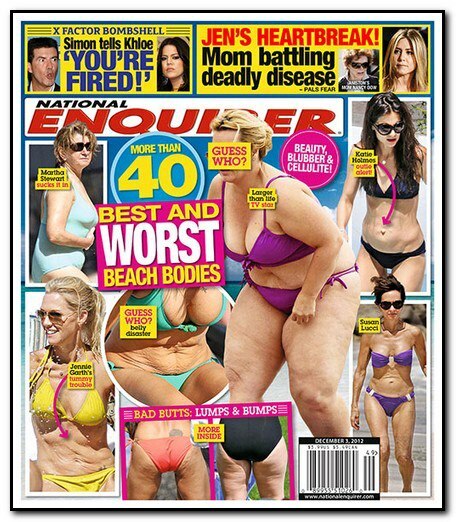 "These magazines, which are displayed prominently at every checkout, are a very real form of bullying. What's more, they further perpetuate the idea that women should have flawless bodies, thereby exacerbating the problem of negative body image, particularly among female youths, but also among all sexes and age groups. As a schoolteacher, how am I to demonstrate to my students the importance of treating others with respect when everywhere they look society is sending a message to the contrary?" To Loblaws' credit, the offending issue was removed from your aisles, but only in Newfoundland. So my question to you Mr. Weston, as the executive chairman of Loblaws, if your company felt it appropriate and justified to remove the offending issue from shelves in Newfoundland (and kudos to you folks for that), why not remove it from the store shelves in the rest of the country where the remaining 98.5% of impressionable Canadian children reside?